Place : Bokakhat (23 km), Assam in the northeast of India. Major Attractions : Rhinos, Tigers, Leopards. Area Covered : 430 sq-km. Ideal Time to Visit the Park : From mid-November to early April months. Nearest Attractions : The lush coffee and rubber plantations of the nearby Karbi Anglong, the Karbi villages, meet the Karbi people and observe their way of living. Majuli, Sibsagar, Digboi. Some Major Accesses : Bokakhat, Guwahati, Dibrugarh, Tezpur. Located on the banks of the mighty Brahmaputra River in the far North East of India, Assam, Kaziranga National Park covers an area of approximately 430 sq-km. The swamps and tall thickets of elephant grass makes the Kaziranga National Park Assam the ideal habitat for the Indian One-Horned Rhinos. Due to limitless poaching of the one-horned Rhinos (the prehistoric survivor), the Kaziranga National Park was declared a wildlife sanctuary in 1940. 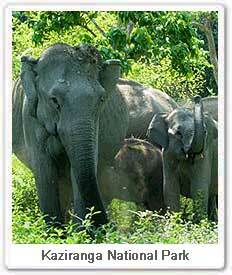 The land of Kaziranga Wildlife Santuary is mainly covered by dense and tall elephant grass. These large distribution of elephant grass are intermixed by small swamplands left behind by the receding floodwaters of the river Brahmaputra. These beautiful swamplands have an abundant cover of water lilies, water hyacinth and lotus. The vegetation that breaks the monotony of these grasslands and swamps are large clumps of semi-evergreen forest. 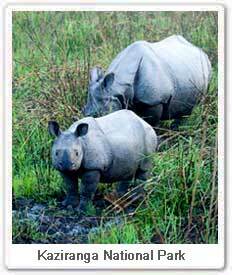 The Kaziranga Wildlife Sanctruary is home to the great one horned Indian Rhino, about 900 in number. Other major wild attractions include a large population of Indian Elephants, Indian Bison, Swamp Deer or Barasingha, Hog Deer, Sloth Bears, Tigers, Leopard Cats, Jungle Cats, Otters, Hog Badgers, Capped Langurs, Hoolock Gibbons, Wild Boar, Jackal, Wild Buffalo, Pythons, Monitor Lizards, etc. Some other animal found here are barking deer, Sambar, golden Langurs, Slow Loris, pygmy hog, capped langur and bears. Kaziranga National Park is a birding paradise. The birds found here include the Oriental Honey Buzzard, Black-Shouldered Kite, Black Kite, Brahminy Kite, Pallas's Fishing Eagle, White Tailed Eagle, Red Junglefowl, Grey-Headed Fishing Eagle, Himalayan Griffon, etc. Huge numbers of migratory birds descend on the parks lakes and swampy areas during winters, including Greylag Geese, Bar-Headed Geese, Ruddy Shelduck, Gadwall, Falcated Duck, Red-Crested Pochard and Northern Shoveller. Rock Pythons and many more varieties of snakes, Monitor Lizards and Turtles. 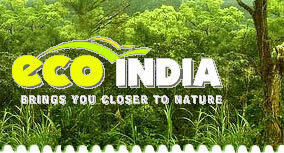 The vast open country makes Kaziranga National Park Assam very accessible and wildlife viewing fairly enjoyable. Here one can leave in the early hours of the dawn for an elephant-back-ride. Authorised and trained Mahouts who guide visitors through the park train the Elephants. One could see wild Elephant herds roaming around or Indian Rhinos browse past visitors unknowingly. Since Kaziranga wildlife Sanctuary is easily approachable, its provides a chance to see animals in the wild at close quarters, thus making a trip to this National Park a very pleasurable experience. Road : The main gate for Kaziranga Wildlife Sanctuary, at Kohora on the NH-37, consists of a handful of cafes and a small local market. ASTC and private buses stop here on their way to and from Guwahati, Tezpur and Upper Assam.